It has been just a few days since Spider-Man, the highly-anticipated title from Insomniac Games was released exclusively to the PlayStation 4 worldwide. Now, a sweet gesture in the form of an easter egg was released with the game, but a change in circumstances transformed a marriage proposal to one of the saddest Easter egg in video game history. Back in May, Tyler Schultz reached out to the developer to ask for help to propose to his then-girlfriend in a "big way." Marvel's Bill Rosemann and Insomniac Games replied to his request and hidden the proposal somewhere in the game. Currently, the proposal can be found on a marquis sign that reads, "Maddie, will you marry me?" "I'm actually kind of happy it's in this game. A lot of people, when I told them how I was going to propose to her, I don't think they understood that there was a literal piece of this game that anybody can go to." 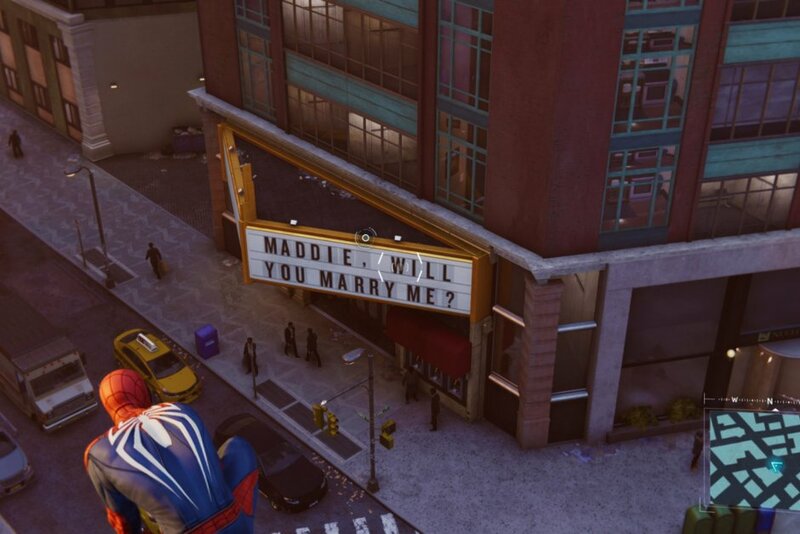 Insomniac Games responded to the situation as the game's art director, Jacina Chew, offered to have the marriage proposal patched out of the game if Schultz would wish. Spider-Man is now available exclusively to the PlayStation 4.